Migration from fixed-line services to mobile alternatives continues to hurt Telkom, with the number of fixed lines in service plummeting to less than 3,9m at the end of September from 4,1m a year ago. The operator’s interim results for the six months ended 30 September 2012 show that the fixed-line penetration rate — as measured by the number of active lines in service as a percentage of the South Africa’s population — has fallen to just 7,5% from 7,9% a year ago. However, over the same period, the number of broadband digital subscriber lines has increased by 5,8% to 841 000 from 795 000. “Revenue continues to reflect the impact of fixed-to-mobile substitution, which has become more prevalent over the last few years,” Telkom says in a statement accompanying its results. Worryingly, Telkom’s Internet service provider business, Telkom Internet, performed particularly poorly in the six-month period, shedding 7,3% of its subscriber base despite the growth in digital subscriber lines. The loss-making mobile business performed better, with revenue up by almost 200% to R898m. The number of active subscribers climbed by more than 50% to reach 1,5m, of which 1,1m are prepaid. Blended average revenue per user (Arpu) climbed marginally to R68,62/month, although post-paid Arpu slumped by 40,8% to R169,30. Prepaid Arpu was up by 6,8%. Telkom had 2 067 base stations at the end of September, up from 1 399 a year ago. Group headline earnings per share from continuing operations plummeted by 80,6% to 37,2c from 191,7c previously. This was largely as a result of a provision that had to be made for the R449m fine handed down recently by the Competition Tribunal for previous anticompetitive abuses. Telkom has said it will appeal against the tribunal’s decision. 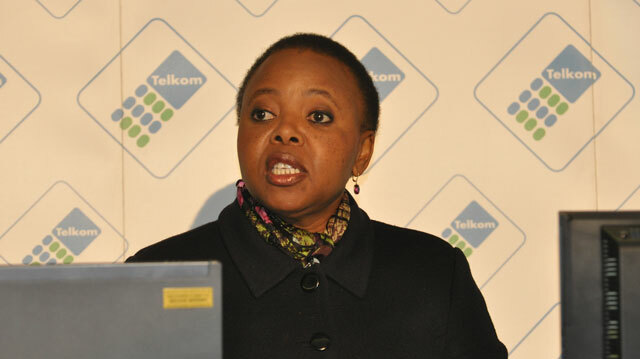 Telkom group CEO Nombulelo Moholi, who said earlier this month tendered her resignation, says that Telkom has reached a “pivotal crossroad” strategically. “While we anticipate government providing an understanding of the policy direction, we will remain focused on achieving our current business strategy,” she says. Government, which is Telkom’s largest shareholder with a direct 39,8% stake, is understood to be mulling several strategic options for the company, including a possible delisting from the JSE and nationalisation.